"Before starting law school, I taught middle school math in Baton Rouge, Louisiana. That experience taught me the true value of grit and creativity. I believe those traits are also invaluable in the legal field, and I strive to use them, approaching legal puzzles with tenacity and creativity." Emily is an environmental litigator practicing in the firm’s New Orleans office. 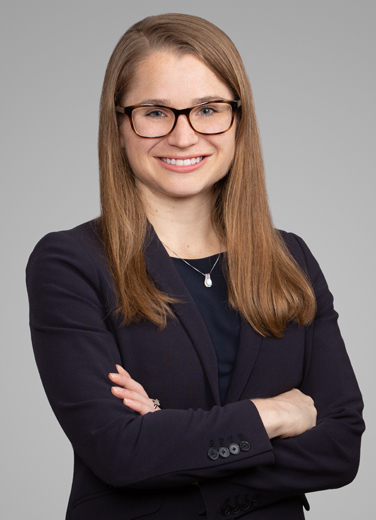 Prior to joining the firm, Emily practiced complex business law in the litigation group at Skadden, Arps, Slate, Meagher & Flom LLP in Houston. Immediately after law school, she clerked in the Western District of Louisiana with Judge Minaldi. Emily received her Juris Doctor from Tulane University Law School in 2016, graduating first in her class. During law school, she also served as a judicial extern to the Honorable James L. Dennis of the United States Court of Appeals for the Fifth Circuit and the Honorable James Brady of the United States District Court, Middle District of Louisiana. Represented major pharmaceutical company in opioid-related litigation filed in Texas state courts. Represented exploration and production energy company in securities litigation. Represented exploration and production energy company in state personal injury tort suit. "Outside of work, I like to make things. While I’m not an expert seamstress, carpenter, painter, artist or chef, I like the puzzle of putting something together, being able to add a little creativity, and the satisfaction of having a tangible product at the end. I also dedicate more time than I ever thought I would to my dog Praline, a dachshund mix—going for runs and playing at the dog park."